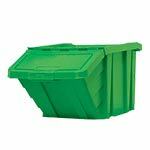 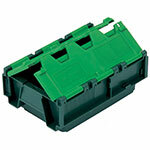 Versatile plastic containers with hinged lids in green, black, blue, yellow and red. 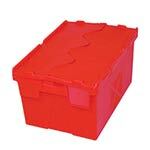 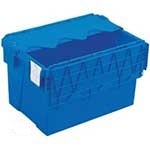 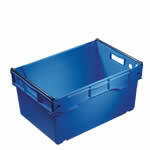 Distribution containers with integral hinged lids, ideal for conveyor use. 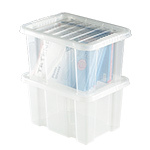 Protect your electronic products and components from the unseen dangers of Electrostatic Discharges. 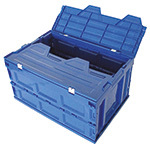 Our euro containers take a lot of beating – literally and metaphorically. 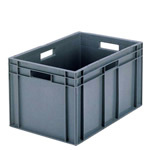 Not only are they excellent value, they’re also amongst the toughest stacking containers available, cheerfully withstanding a good deal of wear and tear. 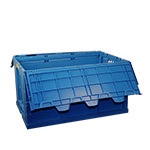 Available in a range of sizes, they’re all built to conform to European modular dimensions for palletisation. 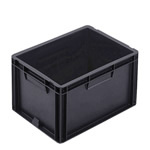 Their solid sides allow safe, stable and compact stacking and are ideal for cold storage. 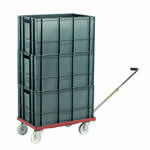 The vertical sides guarantee maximum useable volume and a range of accessories (lids, dollies and covers) are also available. 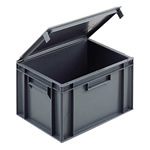 If you’d prefer containers which store away extremely compactly when not in use, check out our range of stack and nesting boxes. 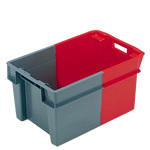 Available in a range of colours for colour coding, these crates have sturdy plastic stacking bars for stable stacking when full. 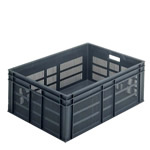 When empty, just flip them open and the crates nest together, saving 60 – 70% of space. 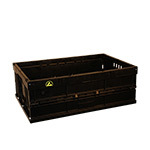 Our bail arm stack / nest crates are an ideal choice of container when containers need to be stacked. 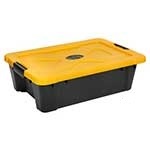 Containers sit on top of each other allowing the full storage space to be used.